Distruzione. Poema futurista col processo e l'assoluzione di "Mafarka il Futurista". London: John Lane, The Bodley Head,, 1911. Octavo. 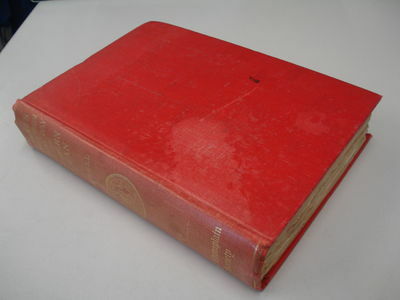 Original red cloth, title to spine and front cover white, top edge red. Spine faded, a few faint marks to covers, a couple of nicks and spots to fore edge. First edition, first impression. Presentation copy, inscribed by the author on the title page, "Reginald Turner, from H. G. Wells. One heart, one mind. Same opinion of A. J. Spender." The recipient, Reginald "Reggie" Turner (1869-1938), was a member Oscar Wilde's circle, who once quipped in response to Maugham's boast of the rarity value of his first editions that it was his second editions which were almost impossible to procure. It is possible that the "A. J. Spender" referred to in the inscription is J. A. Spender (1862-1942), British journalist and editor of the Westminster Gazette from 1896 to 1922, and that Wells has transposed Spender's initials, as seen in another copy inscribed by Wells that we have encountered. 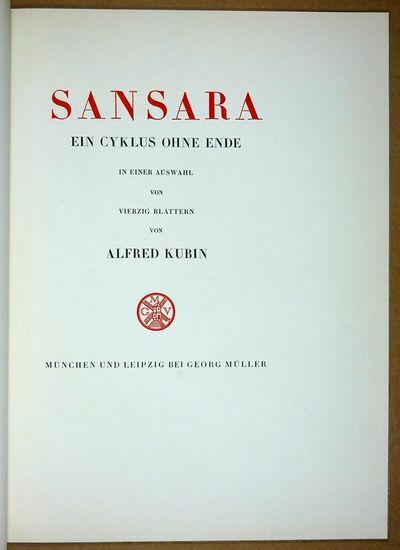 Sansara. Ein Cyklus ohne Ende. In einer Auswahl von vierzig BlÃ¤ttern. Oscar Wilde. The Writings of Oscar Wilde. "Cherwell Edition"
A striking image. Rare. "In 1911 [Telmányi] attracted international attention with his Berlin début, when he gave the first performance in Germany of Elgar's Concerto. Admired for the fluency and vitality of his playing, he also acquired a reputation as a conductor after his début in 1919 at Copenhagen... Telmányi married Anne Marie, younger daughter of Nielsen, in 1918, and eventually settled in Denmark... Telmányi's interest in problems of performing Baroque music led him to bring about the construction of a special violin bow... It was favourably received as a means of playing true chords across the strings softly as well as loudly, avoiding the usual arpeggio effect..." Noël Goodwin in Grove Music Online.. 683 x 450 mm. Printed on light-weight paper laid down to board. Signed by the artist in pencil at lower left. 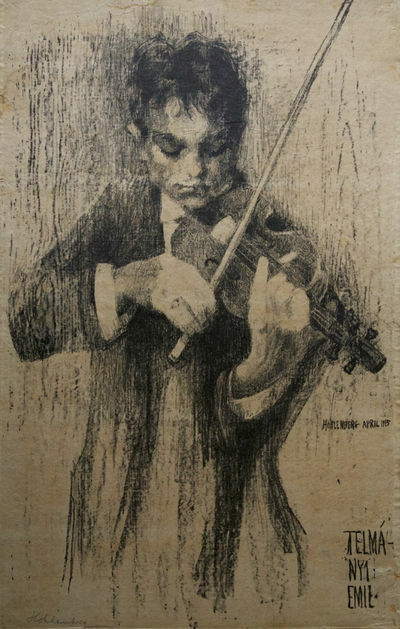 With the names of both the artist (dated April 1915) and the violionist in the stone. Browned; margins slightly abraided with slight loss of paper. Edinburgh: John Grant,, 1911-12. 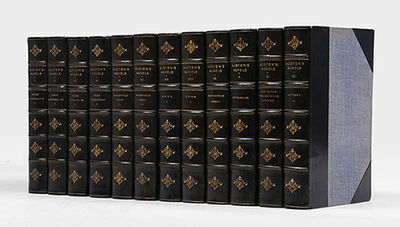 12 volumes, octavo (206 X 137 mm). Finely bound by Ramage in blue half calf, titles and decoration to spines gilt, raised bands, blue cloth boards, marbled endpapers, top edges gilt, others untrimmed. Engraved frontispiece to volume 1. Minor rubbing to spines, an excellent set. The Winchester edition; considered the most attractive of the unillustrated editions of Jane Austen's works produced around this time. 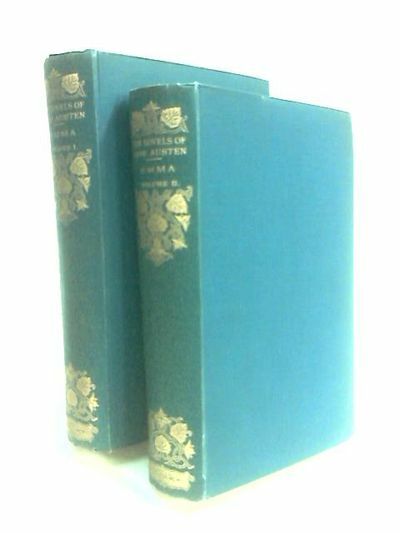 In this enlarged issue, the set has two additional volumes, comprising Lady Susan and The Watsons, taken from the 1871 Memoir, together with Jane Austen's letters. Ausdrucksstarkes Ölgemälde \" Einlaufendes Segelschiff im Abendlicht \". On the Art of the Theatre. Chicago: Browne's Bookstore, , . Large square octavo. Original quarter vellum, vellum corner tips, gilt lettered spine, olive green boards and endpapers, Gordon Craig's gilt monogram on front cover, top edges gilt, untrimmed. Photogravure portrait frontispiece of Craig by Edward Steichen, 20 plates after designs by Craig tipped-in on drab brown heavy stock paper (with captioned tissue guards). Small area of damage to fore-edge of back cover, touch of foxing to frontispiece, offsetting from plate mounts to letterpress. A very good copy. 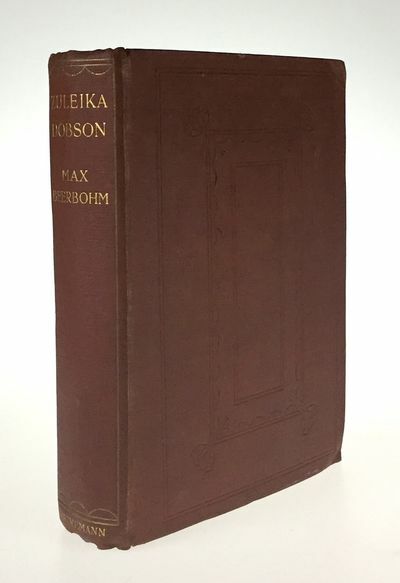 First and limited US edition, number 68 of 150 copies signed by the author (75 of which were reserved for the US); also inscribed by the publisher on a preliminary blank: "To Mr Percy MacKaye with appreciation of much kindness in connection with this book. Waldo R. Browne". Percy MacKaye (1875-1956) was an American dramatist and poet; there is a tipped-in photograph on a preliminary blank that would appear to be a portrait of MacKaye reading this book. On the Art of the Theatre is Craig's "highly influential book... in which he expounded his visionary ideas" (ODNB). London: Cassell and Co.,, 1911. Illustrated by N. C. Wyeth. Quarto. Original green cloth, gilt lettered spinet, colour illustration mounted on front cover, pictorial endpapers, top edges green. Colour pictorial title page and 9 colour plates. Occasional spotting to pages, ends of spine and corners lightly bumped, light spotting to spine. A very good copy. 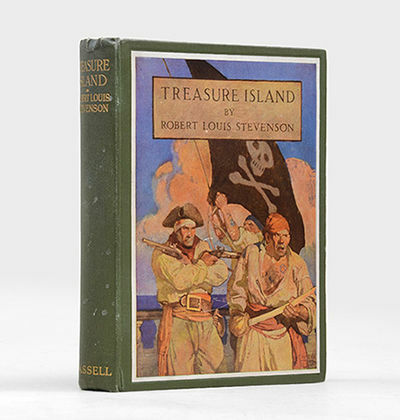 First Wyeth edition, first UK printing. One of the best illustrated editions. 1834 Mt. Vernon St., Philadelphia, 1911. 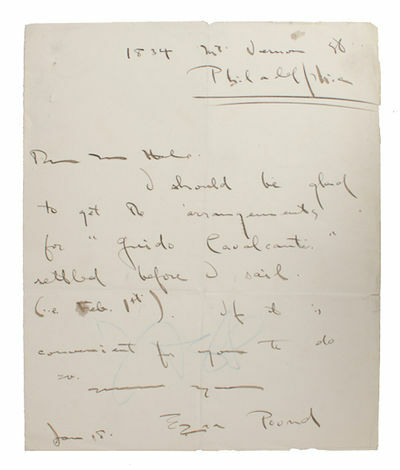 One page autograph letter signed by Ezra Pound to Ralph T. Hale, an editor and publisher with Small, Maynard & Co. "Dear Mr. Hale, I should be glad to get the arrrangements for "Guido Cavalcanti" settled before I sail (i.e. Feb. 1st). If it is convenient for you to do so. Sincerely yours, Ezra Pound | Jan. 18." A single sheet of paper, folded in half to create four leaves, written on the first leaf only. Then folded twice more to fit into the envelope. Minor wear and soiling on the letter, faint blue pencil scribble underneath the writing, but generally in Very Good condition. An early letter from Pound with an important literary connection, written when he was 25, regarding his translation of Guido Cavalcanti (first published by Small, Maynard in 1912). Cavalcanti was an early Italian poet who had considerable influence on the writing of his friend, Dante Alighieri. Phillips, Stephen / Vernon Hill. The New Inferno - With sixteen Drawings by Vernon Hill. Reise durch die deutschen Kolonien. Herausgegeben von der illustrierten Zeitschrift „Kolonie und Heimat\". Band 1: Deutsch-Ostafrika (dritte verbesserte Auflage 1912). Band 2: Kamerun (zweite verbesserte Auflage 1911). Band 3: Togo (zweite verbesserte Auflage 1912). Band 4: Deutsch-Südwestafrika (1911). Band 5: Südsee (zweite verbesserte Auflage 1912). Band 6: Kiautschou. Herausgegeben von Rudolf Wagner und E. Buchmann (zweite verbesserte Auflage 1913). China, Japan, Burma, Malaysia, and India, 1911. Photograph Album. Very Good. The album measures 8" x 6" and contains 52 pages with approximately 130 photographs of varying sizes. The photographs are in nice shape as are the album pages, however most of the album leaves have cleanly separated from the binding. 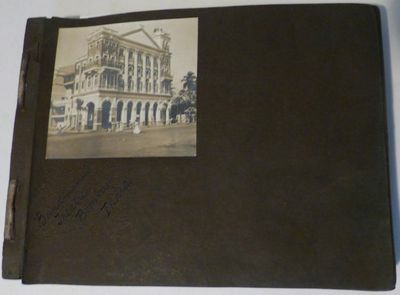 The album documents John Wilmuth Merkyl's participation in a theatrical tour of Southeast Asia during 1911. Early in his career, Merkyl (sometimes spelled Merkel) was an actor in operettas and later became a popular early silent movie star. When Merkyl compiled this album, he was touring with the Bandman Theater Company (owned by Maurice E. Bandmann, an American expatriate from Montana) in one of its troupe's circuits through Asia where it owned a number of theaters. Although Merkyl's name does not appear in this album, it comes from the estate of one of his descendents and contains several photographs of him as a young man. Most of the photographs are vernacular, however a few are commercial. The images include members of the troupe, theaters (Bombay, Rangoon, Kuala Lampur, Singapore, Tokyo, Osaka), hotels (Albany Hotel in Calcutta, Minto Mansions in Rangoon, the Royal Selangor), the Indian Coronation Ceremony (Durbar) for King George V and Queen Mary, tourist sights and scenes (temples, gardens, city streets, countryside), transportation (sedan chairs, rickshaws, junks, sampans, trains, oxcarts, donkeys), severed heads, children, markets, soldiers, buildings (pagodas, thatched huts, a cockfight), an impromptu performance on a ship, and more. A unique record of theatrical entertainment during the heyday of the British Empire. 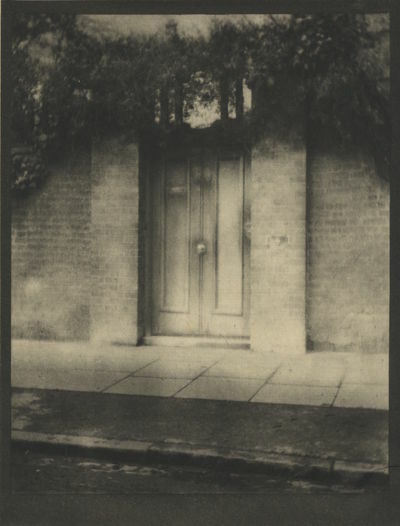 THE DOOR IN THE WALL Illustrated with Photogravures from Photographs by Alvin Langdon Coburn. New York & London: Mitchell Kennerley, 1911. First ed. Hardcover. Coburn, Alvin Langdon. Folio, (iv), 153, (i) pp., with 10 tipped-in hand-pulled photogravure plates printed under the supervision of Coburn. Linen-backed gilt-titled paper over boards with moderate scuffing to the paper and corners, small loss of linen on the spine. The gravure plates are rich in tone and have left transfers on the opposing page as is usually found. Internally, a very good copy. There were 600 copies of this book printed but only 300 have the full complement of hand-pulled photogravures, the others are either lacking plates or were completed with plates printed by aquatone, a halftone process. This copy is one of the three hundred that contains all plates in hand-pulled photogravure. THE TRUTHFUL LENS #184. John Grant, 1911. Hardcover. Good. 1911. 712 pages. No dust jacket. Teal cloth with gilt lettering. The Novels of Jane Austen Winchester Edition Volumes VII and VIII. Firm bindings. Moderate foxing, tanning and handling marks with rough edges to pages. Intermittent dog-eared corners with occasional chipping. Tanning along spine. Noticeable bumping, rubbing and scuffing to spine ends and to corners with noticeable rubbing, scuffing and wear along edges and over surfaces. London: Heinemann, 1911. First edition. Original "Rough Cloth Binding," Albert M. Cohn's Copy (bibliographer of George Cruikshank) with his bookplate on front paste down. 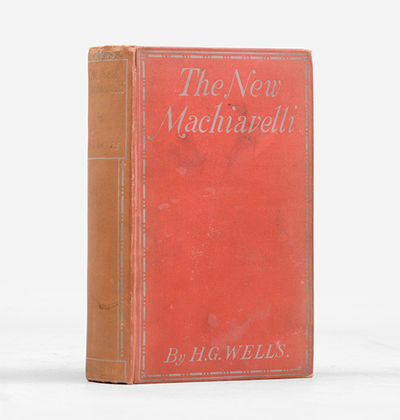 Bound in 'rough' brown cloth with blindstamped design on cover, gilt lettering on spine. "The rough brown cloth and the smooth were issued simultaneously. Copies in the rough binding were sent to the circulating libraries because they found that smooth cloth was unsuited to the hard wear to which library book are subjected." (Muir Points, p.92). Beerbohm's first and only novel. Near fine copy, rear hinge cracked. Binding clean, fresh and bright. Housed in mathcing folder and 1/4 brown smooth morocco slipcase with gilt lettering. Extremely scarce thus. Die Deutsch-Ostafrikanische Zentralbahn, der Tanganyikaverkehr und die ostafrikanischen Finanzen; Anhang: Die Kongo- Abtretungen; eine kolonialwirtschaftliche Studie. Kain. Zeitschrift für Menschlichkeit. Jahrgang I, No. 1, April 1911 bis No. 12, März 1912 sowie beigebunden: Abel. Zeitschrift für Sklaverei, Fasching 1912; Jahrgang II, No. 1, April 1912 bis No. 12, März 1913; Jahrgang III, No.1, April 1913 - No. 12, März 1914; Jahrgang IV, No. 1, Mitte April 1914. Wolff. L'Oiseau Bleu. c1907 etc. - Souvenir tile ca. 153 x 153 mm. commemorating the "Inaugural Night and First Night of the Subscription, when Gounod's Opera of "Faust." Will be presented with the following Cast" including Campanini, Novara, del Puente, Contini, Scalchi, Lablache and Nilsson, October 22, 1883. - Annual reports 1967-68, 1968-69, 1969-70, 1970-71, 1971-72. Gilead Balm: Knight Errant His Adventures in Search of The Truth. Autograph letter signed "P Mascagni" to an unidentified impresario in Vienna, addressed "Mio Caro." - 2 pp. Quarto. Dated Rome, October 8, 908. In black ink. On stationery with "Corso Vitt. Eman. 154. Telefono Interprov. 458. Per telegrammi: Mascagni, Roma" printed in red at upper left. In Italian (with translation). Mascagni responds to a proposal to write a "true and authentic" operetta. He likes the idea, but would encounter difficulties "of the moral-artistic order," and especially with his publishers, Choudens and Sonzogno. As indicated by his use of "tu," Mascagni and his correspondent were on familiar terms. 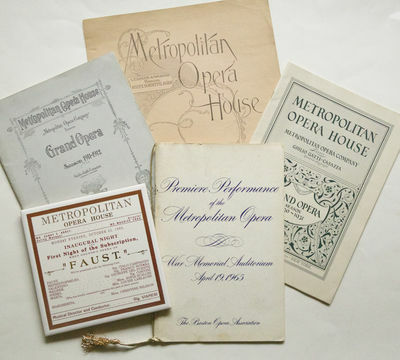 "But there is still a material difficulty, represented in my contracts with the publishers Sonzogno in Milan and Choudens in Paris, who will not want to adjust [their contracts] if they knew I worked for an impresario from Vienna before having delivered (as per contract) the operas that I must write for them. As you've seen I haven't spoken of monetary interests. but profits have never been a difficulty for the closing of my [business] deals. "Slightly worn; creased at folds. Together with: A postcard photograph of 5 gentlemen on a street corner dated Paris 1911 on mount: Mascagni, the music publisher Edoardo Sonzogno, the writer Gabriele d'Annunzio and two unidentified others. Mascagni, distinguished as both a composer and conductor, is perhaps best-known for his opera Cavalleria rusticana, which "was enormously successful from its first performance at the Costanzi in Rome in 1890. From then on Mascagni spent the rest of his long career treating a wide variety of subjects. His next opera, L'amico Fritz (1891), consolidated his success with Roman audiences, and revealed his lyrical vein. This fluent rustic comedy was successful particularly because melodic vitality - the outstanding merit of Cavalleria - was combined with a more elegant harmonic idiom." By the time this letter was written, Mascagni had also garnered considerable acclaim in Vienna, Paris, and London. Michele Girardi in Grove Music Online. Philip Lee Warner for The Medici Society Ltd, London 1911 - 10 coloured tipped-in plates. 4to. [271 x 202 x 16 mm]. xiii, [i], 36,  pp. Bound by Stikeman of New York (signed in gilt on the rear turn-in) in brown goatskin, the covers tooled in gilt with a triple and double fillet border and panel of fillets and gouges, intersecting at the corners and entwined with leaft stems. The spine divided into six panels with gilt compartments, lettered in the second and dated at the foot, the others with leafy stems, the turn-ins tooled with gilt rolls, marbled endleaves, top edge gilt, the others untrimmed. (Joints and spine slightly rubbed and polished). No.148 of 500 copies. The original paper labels have been tipped-in at the end. La Sorcière. Texte Intégral. publié Avec Une Préface Par Ad. Van Bever. Soixante-neuf Compositions Originales De Martin Van Maele, Comprenant 15 Planches Gravées a L'eau-Forte Par L'artiste et 54 En Têtes et Culs-De-lampe Gravés Sur Bois Par Eugène Dété. Une excursion au Congo Belge. New York: Duffield & Company,, 1911. Octavo. 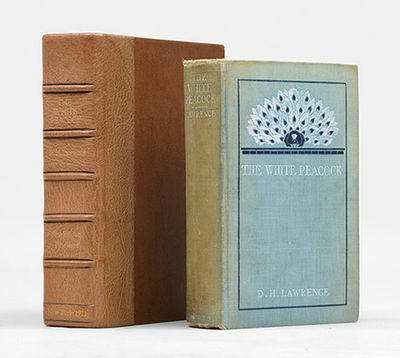 Original light blue cloth, white lettered spine and front cover, spreading peacock motif in white and dark blue on front cover. Housed in a custom made brown cloth chemise and quarter brown morocco slipcase. Spine rolled and toned, head of spine frayed, peripheral fading to covers. 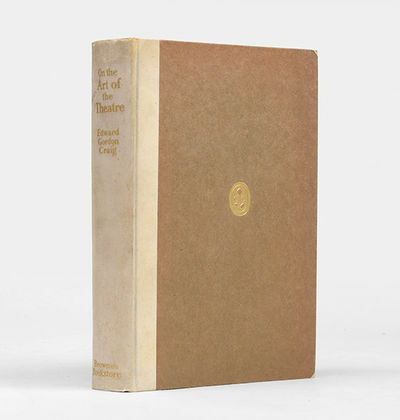 First edition, first printing, of Lawrence's first book. This is the rare first issue with the copyright date "1910" on title page verso. Osaka. : Osaka Mainichi Shimbun.. Meiji 44. 1911.. Color lithograph, sheet size 30 1/2 x 42 1/2 inches, folded as issued. Some short separations at folds, overall very good condition. A beautifully printed poster (with gold and silver highlights) detailing Japanese (western-inspired) uniforms (military and civilian) of the Meiji period. It was issued as a special supplement on the first day of Meiji 44 by the newspaper company of Osaka Mainichi Shimbunsha. At centre is an image of a military parade by Cappey Hirose; the beautiful art nouveau style border features medals (with numbers linking them to descriptive text). . London. : W. R. Howell & Co.. 1911.. Etching, plate area 15 3/4 x 21 1/2 inches on sheet size 19 1/4 x 25 inches, with original title sheet. Three pin prick sized spots in outer margins, very good clean condition. 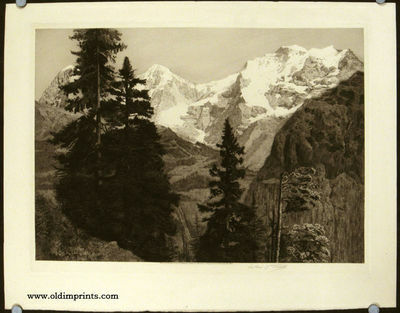 An original etching by Arthur Turrell featuring snow-covered mountains in Switzerland viewed through a forest. Title sheet includes a diagram to the mountains depicted (Eiger, Monch, Jungfrau). From "Six Original Etchings. By W. L. Wyllie, R.A., R.E., Wilfrid Ball, R.E., Fred Slocombe, R.E., Arthur Turrell and J. Alphege Brewer. Signed Artists' proofs. Limited to Four Hundred Copies." Published by W. R. Howell & Co. Signed in pencil at lower right of print. Includes a facsimiled copy of the portfolio title page. .
Heyer, Chas. A. & Co.
Jagd- und wissenschaftliche Expeditionen in Ost-Afrika. Organisation und Ausrüstung durch Chas. A. Heyer & Co, Nairobi, Britisch Ost-Afrika. Filialen und Stationen in allen Teilen Britisch und Deutsch Ost-Afrikas. - Kaltnadelradierung, mit Plattenton, 1911, auf chamoisfarbenem Pellet et Legrand-Bütten, signiert und nummeriert. 21,5:15,5 cm. Provenienz: Mit dem Stempel des Verlegers Pellet, Paris, Lugt 1193; Sammlung Prof. Dr. Dirk Kocks, Köln; Sammlung: Louis Legrand. Hargesheimer & Günther, Düsseldorf, Auktion 19.04.2008, Nr. 426C mit Abb. Literatur: Arwas 419. Nr. 30 von 50 Exx. &#150; Vorzüglicher breitrandiger Abdruck und von tadelloser Erhaltung. &#132;Legrand verdankt seinen Ruf den mit technischem Raffinement mehrere Verfahren kombinierenden Radierungen, für die gegenständlich ein gewisser erotischer Einschlag und formal eine weich vertriebene, häufig ins Ungraphische sich verlierende, mit scharfer Betonung der Konturen sich verbindende Modellierung der Innenflächen charakteristisch ist, und seinen Lithographien." (Thieme-Becker, Bd. XXII, S. 572). London: Frederick Warne & Co.,, 1911. Sextodecimo. Original green boards, spine and front board lettered in white, pictorial label with illustration to front cover, pictorial endpapers. 27 colour plates. Contemporary gift inscription to front free endpaper. Boards gently bowed, contents a little cockled. An excellent copy. First edition. The first two printings are believed to be identical. 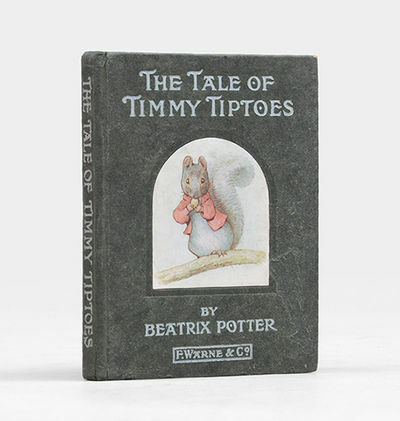 The story of Timmy and Goody Tiptoes is the only Beatrix Potter story apparently set in North America - although this is implicit rather than stated anywhere in the book. All the main animal characters are indigenous to North America: grey squirrels, chipmunks and a "large bear", but the waters are muddied somewhat by the presence of Yellowhammers (or Emberiza citrinella, the birds which sing "Little bita bread and-no-cheese! "), whose range includes Europe and much of Asia but not America. Flagstaff: The Coconino Sun, 1911., 1911. First edition. First edition. 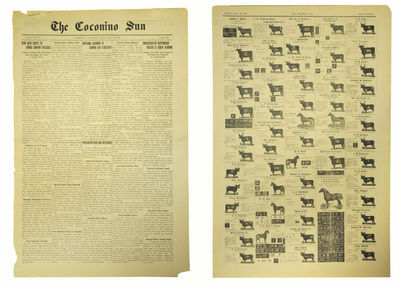 13" x 20" newspaper issued by The Coconino Sun of Flagstaff, Arizona, Friday, May 19, 199, Volume XXVIII, Number 25. This newspaper is a descendent of the Arizona Daily Star, Tombstone's Daily Nugget, Arizona Daily Sun, the Mohave Miner, The Coconino Sun was named by Clarkson M. Funston, its editor, to coincide with the founding of Coconino County, with Flagstaff as the county seat. However six months later the name of the newspaper was again changed to the Coconino Weekly Sun. In 1896 attorney Jerome Edwin Jones, owner of the rival newspaper, the Flagstaff Democrat, purchased the Coconino Weekly Sun and merged the two newspapers into the Flagstaff Sun - Democrat. Then due to Flagstaff's nickname being the Skylight City, Jones once again changed the name of the newspaper on November 25, 1896, to the Skylight Kicker, as he promised "to kick higher, quicker, truer, harder and more than any newspaper in the West." However on January 15, 1898, Clarkson M. Funston re-purchased the newspaper and changed the masthead back to the Coconino Sun, which then became the area's dominant newspaper. The newspaper carries news pertinent to northern Arizona and continued to be published into 1978. This newspaper issue being offered for sale is a weekly which was published each Friday of the week and this copy was published on Friday, May 19, 1911. Its contents include news of the territory, news of local citizens and their various journeys and events, the murder of a prominent official, Base Ball Dope, church directory, Probate Court notices, range and market news, advertising, educational articles, lumbering, railroad news, and everything that was fit to print. The importance of this issue is that it shows 72 ranches with over 125 of their brands on cattle and horses. The ranches are from the communities of Canyon Diablo, Ash Fork, Flagstaff, Williams, Cornville, Winslow, Camp Verde, Dewey, Seligman, Maine, Sedona, and Jerome. The six pages are separated and in very good condition. The Champlain Society. Hardcover. Extremely scarce limited edition book. General wear to boards with two faded soiling stains to the front board - some toning to spine and lightly bumped corners. Pencil signature from a previous owner to front pastedown. Content is very clean for age with slight toning and a little spotting to a few pages. Fold out maps to rear. No DJ. . Good. 1911. Hyperiion-Verlag Hans von Weber,, München, 1911 - München, Hyperiion-Verlag Hans von Weber, 1911. Gr.-4°. 344 S. Original-Pergamentband mit schwarzem Titel auf Deckel und Rücken. Rodenberg 461. - Monumentalausgabe des zweiten grossen Heldenepos der mittelaltelichen deutschen Literatur nach dem Nibelungenlied. Nr. XXIV von 100 Exemplaren auf ungebleichtem Hundertbütten von Van Gelder Zonen für die Mitglieder der Vereinigung "Die Hundert", aus einer Auflage von 1507 Exx. Druck von Joh. Enschedé en Zonen, Haarlem. Die Drucklegung wurde von Ersnt Schulte-Strathaus überwacht. - Einband leicht angestaubt. Original-Pergamentband mit schwarzem Titel auf Deckel und Rücken. The Emir of Bokhara and his Country. Copenhagen: Gyldendalske Boghandel, Nordisk Forlag; London, William Heinemann, , 1911. Journeys and Studies in Bokhara (With a Chapter on my Voyage on the Amu Darya to Khiva.) Large octavo. Original plum cloth, title gilt to front board and spine. 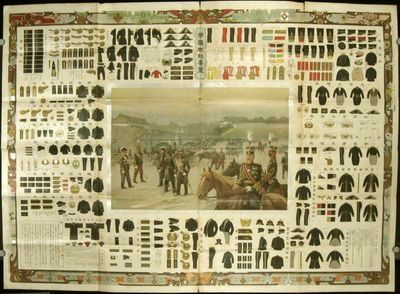 Large folding coloured map in band inside lower board, numerous half-tone illustrations from the author's own photographs to the text, many full-page. A little rubbed, the spine lettering a touch oxidised, judicious restoration at the head of the spine, light foxing to the prefatory matter and fore-edge, else very good. First Edition. This copy inscribed by the author on the title page. 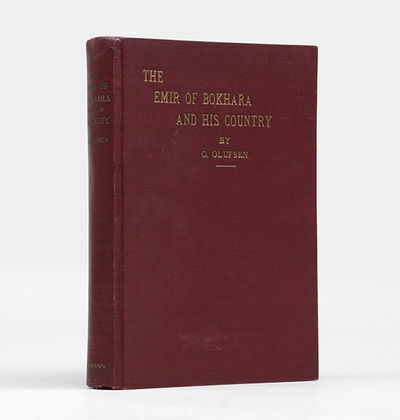 Highly detailed and well-illustrated study of the region by the Secretary of the Royal Danish Geographical Society, drawing on the material accumulated during his command of the First and Second Danish Pamir Expeditions, 1896-97, 1898-99, from which he brought back more than 700 artefacts of ethnographic and scientific significance now at the Danish National Museum in Copenhagen. Olufsen was fluent in Russian and Usbegic, so he was able to conduct his own interviews with natives, employing only a Tajik interpreter with whom he conversed in Ottoman Turkish. In Bokhara the travellers "were welcomed as guests" by the Emir, lengthening their stay, with the result that the present study "can be used as a work of reference on the details of the region's architecture, archaeology, customs, religions, traditional costume, and for its profuse illustration from photographs of ethnographic and handcrafted pieces, monuments and local peoples" (Gorshenina, Explorateurs en Asie Centrale. Voyageurs et aventuriers de Marco Polo Ã Ella Maillart, pp. 225, cataloguer's translation). Quite a fragile production, the thin cloth, heavy text-block, and large folding map all contributing to the frail condition of copies usually encountered, this, lightly and skilfully restored, is a very superior copy, and very uncommon indeed inscribed.